As one of literally three lady gnomes living at The Gnome Abode, the guys naturally looked to me to mend their torn overalls and ripped shirts. Just when you think you’re living in the 21st century, right? But I didn’t let my feminism get the best of me. I gave this wonky machine a chance, and it gave me a chance in return. Sorry boys, I’ve found a new love. And it’s not you. I told the boys to bug off while I made something for myself. I’ve been wearing the same, tired old dress every damn day for years now. 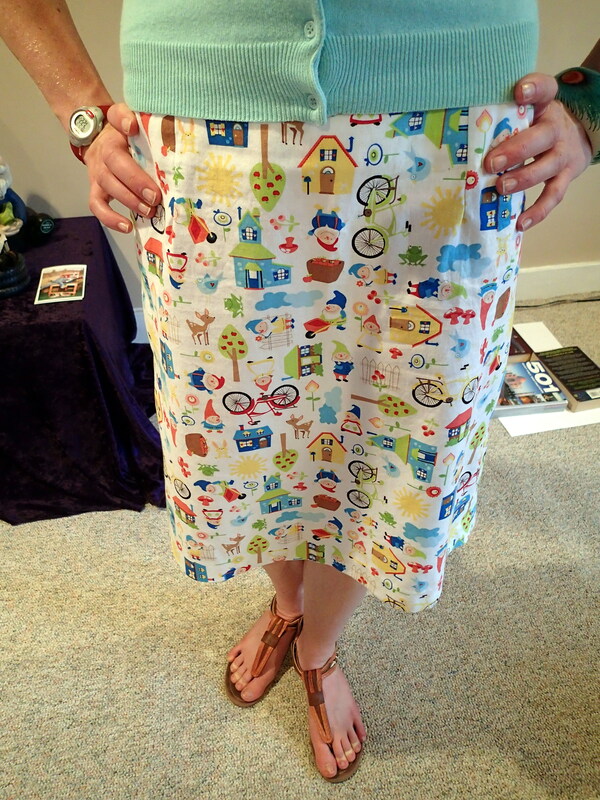 It was time I made myself a skirt…A GNOME SKIRT! 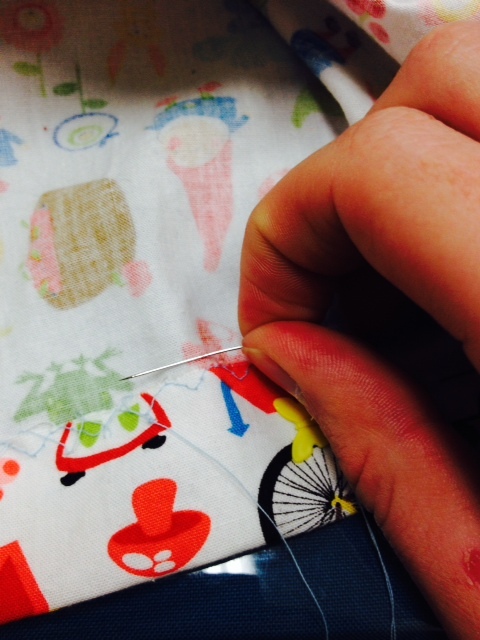 You wouldn’t probably think to look at it, but skirt-making is an incredibly tedious process. There’s a zipper, and a hook, and an eye, and this weird stuff called interfacing, and even though you have a machine you have to sew some stuff by hand. Personally, I still think that whole hand sew thing is whack. This is the technology age for godssake! But after several weeks of trials and tribulations…voilà! A completed skirt! 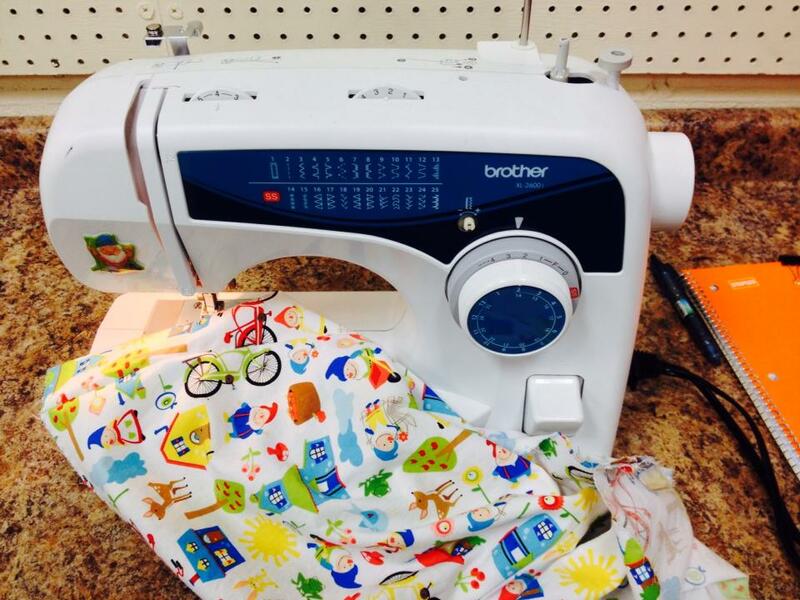 Have you caught the sewing bug? 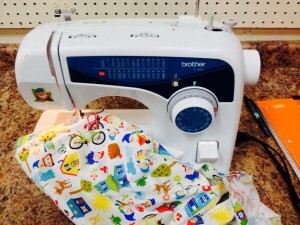 Itching to pick up some gnome fabric of your own? Check out these awesome gnome fabrics! Any other gnome seamstresses out there? I’d love to see your stuff. Red rover, red rover, send gnome pics right over! There once was a place in New York City. It served “unusual bread and rolls.” And it was run by gnomes. Never mind how “unusual” bread products could really, honestly be. You just never mind that. According to to Ephemeral New York, this ad was part of a 1973 New York Mets program. But the story doesn’t stop there. Apparently there was ANOTHER Gnome Bakers location documented 40 years earlier. 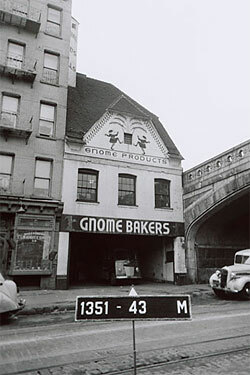 According to New York Times photographer, Fred R Conrad, 316 East 59th Street was home to Gnome Bakers. The bakery owners designed the front of the building to look like the sort of place where tiny gnomes would be mixing up baked goods. Although the picture doesn’t do it justice, a giant bearded gnome once rested against the chimney munching on a piece of bread. Today 316 East 59th Street is home to a chiropractor’s office. Lame. Curbed corroborated the story and revealed that the giant munching gnome and the Gnome Bakers simply disappeared from the premises after they went bankrupt in the early 1930s. 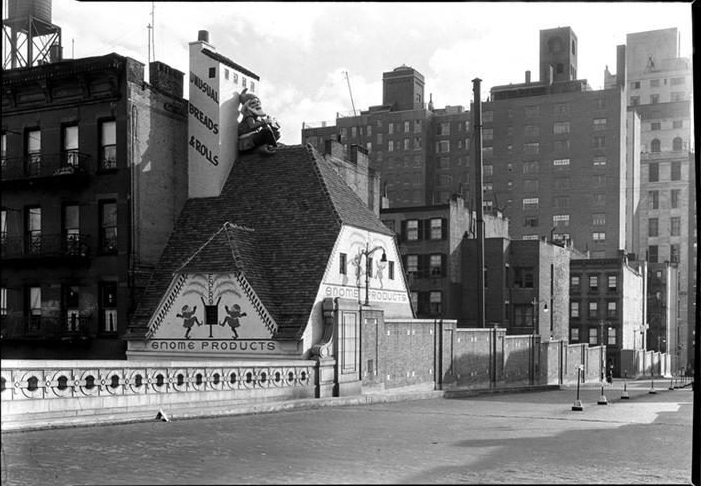 And they found an awesome photo of the giant gnome perched atop the bakery building! But all this research has led me to more questions than answers. Who WERE the gnome bakers? Where did they go in the early 30s? What ever became of the giant munching gnome? And what exactly did make gnome bread SO unusual? I would have loved to be alive in the 30s, if for nothing else, to visit this amazing-looking bakery. So Gnome Bakers, if you’re out there reading this…come back! I’m sure New York would welcome you with open arms and a fresh bag of flour. 446 Gnomes Stand Proud at Australia’s Gnomeageddon 2014! 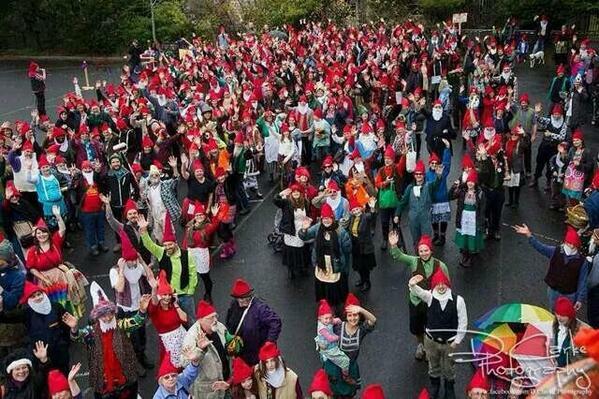 The Guinness World Record for the number of humans dressed as gnomes in one place is 478. Betcha didn’t know that, did ya? Well one Australian group celebrating Gnomeageddon 2014 almost broke that record…but not quite. 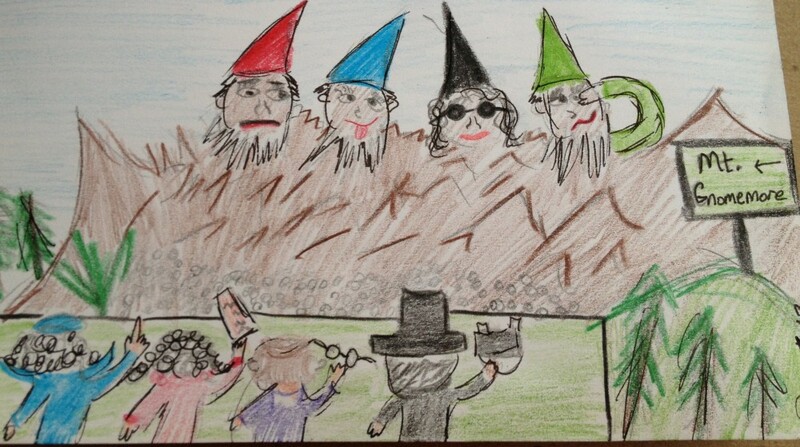 They had 446 gnomes in attendance. Just 33 shy of record breaking! How did this happen YESTERDAY?! Well, if Gnomeageddon tickets include round-trip airfare from the U.S., that is. 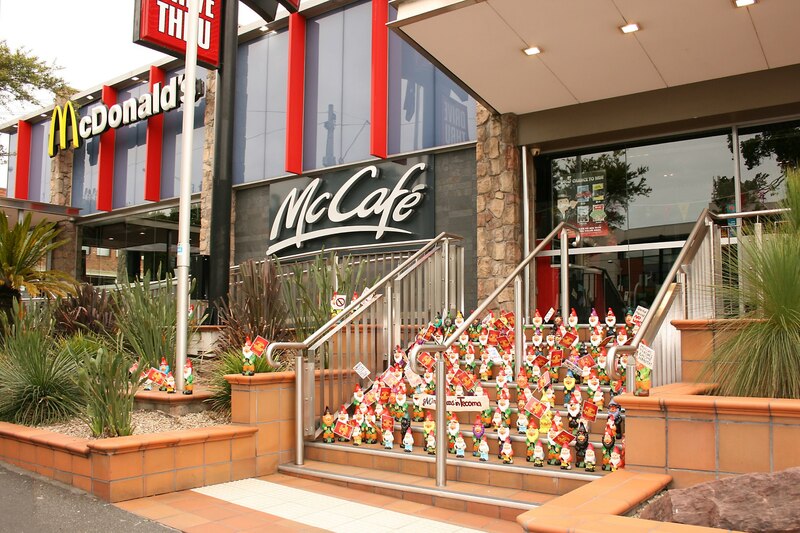 Anyhoo, this recent gnome activity came about as part of a “Gnome Macca’s in Tecoma” campaign. According to the Herald Sun, No Macca’s in the Dandenong Ranges protesters donned gnome hats, aprons and boots yesterday in attempt to shatter a world record for the number of people dressed as garden gnomes. Tecoma is good habitat for us gnomes, the gardens and forest are lush and green and the residents lovingly protect and conserve these spaces. However, should McDonalds build their junkfood takeaway, our moonlight frolicking will be interrupted by lights and traffic, and our habitat ruined by litter. Where will some of us live if the Tecoma No Maccas community garden gets bulldozed?! There is no gnome habitat amongst the fake turf and plastic décor of a McDonald’s. We hear you loud and clear guys. Down with McDonald’s! Up with nature! Now that the dreadful “restaurant” is operating for business, Gnomeageddon will be an annual event until it’s shut down for good. Stay strong, gnomies. Sorry we missed it, and hope to join in next year!